The original people’s car and founding father of the mighty Volkswagen empire, the first Beetle was designed in 1938 and sold throughout the world until 2003. A tough act to follow, we’re sure you’ll agree, and unfortunately for Volkswagen, when it unveiled the second generation model in 1998 it failed to live up to expectations. The original people’s car and founding father of the mighty Volkswagen empire, the first Beetle was designed in 1938 and sold throughout the world until 2003. A tough act to follow, we’re sure you’ll agree, and unfortunately for Volkswagen, when it unveiled the second generation model in 1998 it failed to live up to expectations. Still, the retro movement was just beginning to take, and despite some questionable qualities the Beetle sold relatively well, especially to those who valued kitsch style above anything else. 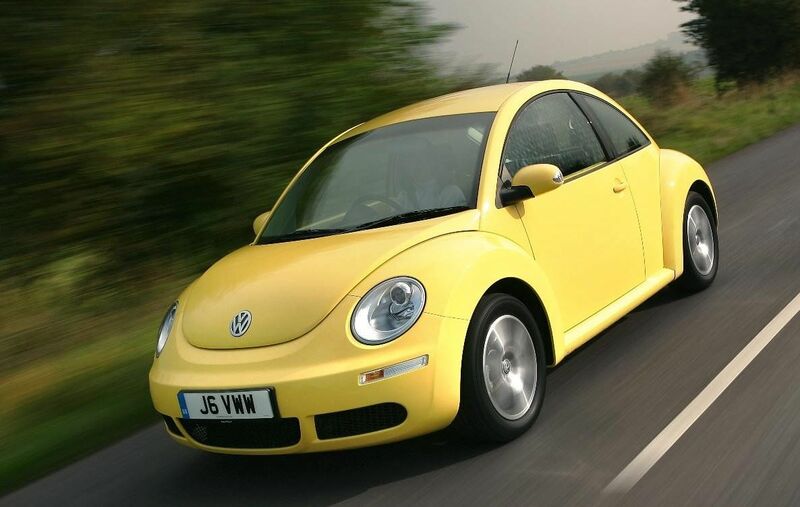 At its launch the Beetle was only available in one style, a quasi-coupé/hatchback with three doors - unlike the first generation the engine was in the front, and behind the rear seats was a 209-litre load space. Cute details abounded though, including a flower holder in the dashboard that came complete with a single bloom when the car was purchased new. Those looking to sun worship had their prayers answered in 2003 when Volkswagen unveiled the Cabriolet model. Based on the then contemporary MK4 Golf chassis the Beetle shared the same engines, some parts of the world even got a 225hp 3.2-litre V6 model, though Ireland made do with a more basic range of powerplants. Petrol choices are limited to the 1.4-, 1.6- and 2.0-litre engines, with between 75- and 115hp. Performance is nothing more than lively though, and it turns out the diesels, with their beefier mid-range thrust, are more exciting from behind the wheel. The 1.9-litre PD (Pumpe Duse) unit isn’t much more powerful than the petrol models (as its near 12-second 0-100km/h time shows), but it feels much stronger. There are even fewer choices when it comes to trim levels; and most of the models available on the used market are High specification. Almost all were sold with manual gearboxes, though a four-speed automatic was offered also. However, the Beetle itself is a niche car, with correspondingly few examples on the used market - especially so with this gearbox. If it were us we’d seek out a 1.9 TDI car, as, despite it offering broadly the same performance as some of the petrol models, the extra mid-range thrust makes it feel much more usable on the road. We’d also steer clear of the Cabriolet, a car whose looks are especially questionable when the roof is stowed. And there’s little to choose from in terms of trim, so just try to find one that has the best overall specification and a few nice options. If you are in the market for a Beetle, then chances are you’ve already made your decision and nothing else will do. However, if it’s just a slice of retro revival you’re after, the modern MINI does it equally well, if not better - and there are far more examples to choose from. Either way, the Volkswagen is distinctive, relatively cheap to run and boasts Volkswagen’s typically excellent engine options.